NYC, 02/20/2019, 6:00PM. 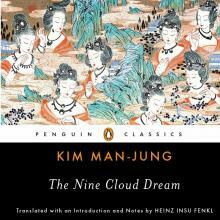 The Nine Cloud Dream: A New Translation of a Korean Literary Masterpiece. Korea’s most prized literary masterpiece: a Buddhist journey questioning the illusions of human life—presented in a vivid new translation by PEN/Hemingway finalist Heinz Insu Fenk.